SING it to my FACE, sounds a bit confrontational, and it just might get that way as an inter-generational choir will battle out their thoughts and opinions on each other at Wellington Cathedral of St Paul premiering this Friday at 7.30 and then only on Saturday at 2.30 and 7.30. 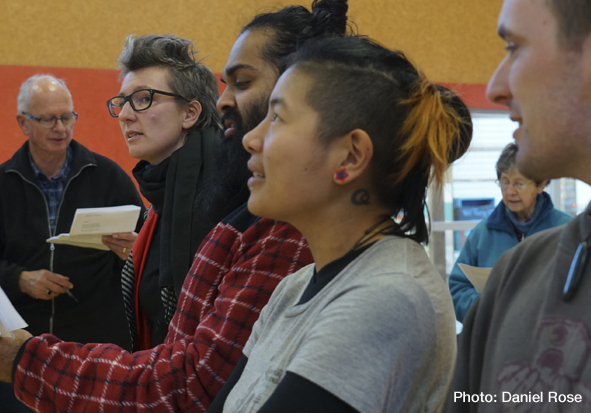 In this interview Wellington’s theater Guru, Jo Randerson of Barbarian Productions and choral champion Julian Raphael of Community Music Junction talk about why they wanted to draw these murmured sentiments out of kiwis and put them to music. Please don’t miss the song Julian sings at the end written by 7 year olds. It does truly make you wonder………. This entry was posted in Arts & Culture, Music by lauriestarfish. Bookmark the permalink.